This 7.62x39 ammunition from Prvi Partizan is an excellent brass-cased load for SKS and AK rifles. 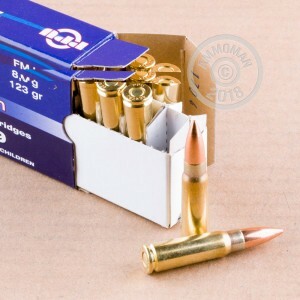 Each cartridge in this box of 20 fires a 123 grain full metal jacket bullet. 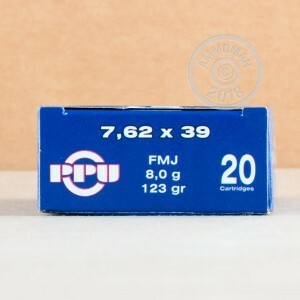 Unlike many 7.62x39mm rounds, this ammo uses non-corrosive Boxer primers and brass cases. It has no steel components and is therefore non-magnetic. This makes it suitable for indoor ranges, which often restrict magnetic or steel-cased ammunition. Great ammo. Not a miss fire or jam through the 50 rounds I used. Great ammo. I will purchase more ammo from Ammoman for all my caliber needs.